Model 416S - 48" deluxe snake tong built to handle most any job, from small to large snakes and reptiles. 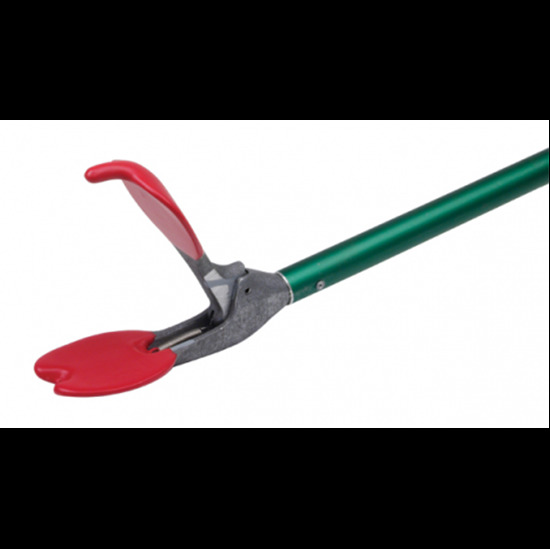 Deluxe snake tongs with super tube feature wide 2.5" cast aluminum jaws and a .090 thick anodized aluminum super tube. The wider jaw distributes holding pressure over a larger area to prevent trauma to the animal and provides more holding power to the handler. These tongs also feature 1) anodized heavy duty aluminum tube, 2) pistol grip handle for one hand operation, 3) strong cast aluminum handle, lever, and extra wide tong jaws, 4) stainless steel aircraft quality cable 5) concealed stainless steel jaw spring.